Version 2.3.1 adds an option in the backend to hide/show the number of articles, solves various bugs; flash component is updated, links target is now "_self". Version 2.2.1 added an option in the backend to show/hide certain menus on the sitemap. Version 2.2.0 solves a cache problem in IE7 and adds the registered users specific menus to the maps (in menu mode). Version 2.1.9 - Main node displays domain name instead of site name and the site name appears in the flash viewer as a tag. Version 2.1.8 brings five new color schemes and several backend options. Issued as open source under GNU/GPL. Joom!FreeMind is a Joomla! 1.5.x native component. Current version adds an option in the backend to show/hide certain menus on the sitemap under menu display operating mode. Version 2.1.9 added five new color schemes and several backend options along with support for one-click install. This extension generates an appealing visual mindmap observing your menus,categories and sections. It makes use of FreeMind - a premier mind-mapping software written in Java and displays the published site structure by connecting the component to a menu, a menu item or to a simple hyperlink placed inside your articles. The name of the component is the same as the one we have chosen for the stand-alone tool (you might want to check this one as well, especially if you are using Joomla 1.0) but note that the previous versions (1.8.x) do not provide complete Joomla! integration. Version 2.0.4 made corrections to the wrong categories and sections links. Several display options and color variation schemes were added in the backend, and Joom!FreeMind 2.1.9 kept the two different ways of rendering maps by either using the sections-categories structure or the published menus. It also brings the option of rendering maps through an alternative flash based viewer if you do not want to use the java viewer on your site. Just upload the zip-archive with Joomla''s Component Installer. Create a new menu in the backend and link it to the component. Adjust the width and the height of the display. The component works fine with JoomFish. You have the option of using built-in functions for character conversion but you can choose mbstring instead. There are also other options which allow you to change the color scheme. 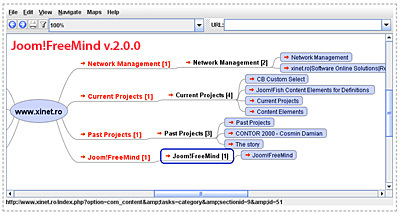 Joom!FreeMind Standalone v.1.8 is a java and PHP based mind map/sitemap generation tool, which renders mind maps from a Joomla 1.5.x or 1.0.x site. It makes use of FreeMind - a premier free mind-mapping software written in Java. Joom!FreeMind panoplies site content in two different ways - by showing the MainMenu sections,categories and articles or by unfolding the complete published menu structure (note: the alternative menu structure does not work in Joomla! 1.0.x due to the absence of a distinct menu table). Joom!FreeMind Standalone is not a Joomla! component and does not require special knowledge for installation. The next versions will handle different character encodings and integrate into Joomla! Contents of the archive should be extracted in a folder of your choice in the root path of your Joomla! installation. No further configurations is required; version 1.6 added options for handling the character encoding from the config file. The two operating modes are illustrated in the index.php file, but you can load the maps for the applet separately and change the appearance as you like for a better integration with Joomla templates. This is not a Joomla! extension. Version 2.2.5 is.